Claire Martin is the senior meteorologist for the CBC. Her background is incredible. She is trained as a meteorologist, not as a television personality and has insisted in her time at CBC that the News Weather Centre be staffed with qualified meteorologists who understand the science behind weather. But her lack of formal training in television presenting has by no means impacted her abilities as an on-air personality. She has been named the “Best Weather Presenter in the World” three times by the International Weather Festival. 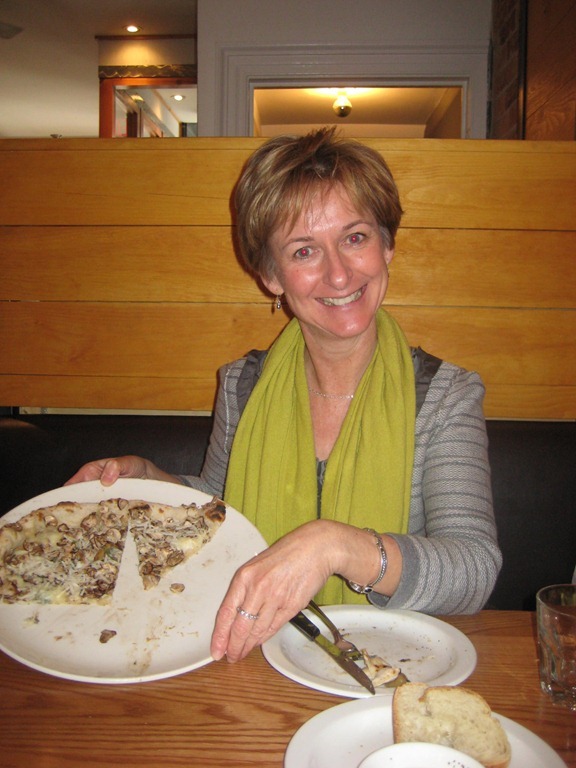 We ate at one of my very favourite restaurants in Toronto, Pizzeria Libretto on Ossington. I honestly dream about this place. I want another pizza right now. Claire had the mushroom pizza and I had the prosciutto pizza and we each had a piece of the other’s. My pizza was awesome as usual, thin crust, tons of prosciutto and a perfect tomato sauce. This is my go-to order. Claire’s mushroom pizza had rosemary and gorgonzola and it was also delicious, especially the bites with the cheese. I had a coffee and we both drank water. Total bill was $40 with tax. Claire does amazing work outside of the CBC by traveling and educating people about weather all over the world. Working with the UN’s WMO (World Meteorological Organization), she has travelled throughout Africa, to Afghanistan and other locations and met with locals to teach them about the science of weather and prediction and how it can impact farming, how to sort out insurance for crops and more. In her travels, she often comes across many other people like herself. People with valuable skills, taking their vacation time to travel and educate locals (in weather, law, broadcasting, etc.) and help them to succeed on their own. You often hear about the international aid organizations working in developing countries and their work is extremely valuable (Doctors without Borders being one of my personal favourites) but you very rarely hear about these individuals who are making huge impact all over the world. When I originally outreached to Claire to arrange this lunch, it was a day or two before Toronto’s big snowstorm at the beginning of February. I always notice when a storm like this approaches, everyone becomes obsessed with the weather. Is it a Frakenstorm? What’s a Nor’easter? Will there be thundersnow? (Okay, maybe it’s only me who asks about that as thundersnow is my fave.) Twitter explodes with nicknames for the storm, Instagram images of snow covered roads, buildings and trees and thoughts on whether Toronto will call in the army. Social media has definitely brought increased interest in weather or maybe it has just illustrated an interest that’s been there all along. And while observing, talking and complaining about weather often seems like a national past time in Canada, the science behind it is incredibly comprehensive. CBC staffs a team of meteorologists, led by Claire, that work every day to analyze and predict weather. Claire told me the amount of data processed daily by the CBC News Weather Centre is more than the data processed daily by a bank. While Environment Canada provides the images of the current weather systems, the CBC team will work together to analyze its path, timing, impact and what it will mean to regular folks just trying to go about their day. This scientific analysis is why Claire wanted to ensure that her team members were trained meteorologists. She also mentioned that there is an art to the flow of weather patterns and the most successful meteorologists have both the scientific credentials and an artistic side. I have already shown my love for thundersnow but I wanted to know what type of weather is of most interest to Claire. She didn’t even take a second to think about it: hurricanes. She talked about how this is a weather system that all animals feel, there is a smell in the air, its power is all around you and there’s nothing else like it. Although she wasn’t on-site for Sandy, she has traveled to hurricane sites in the past including Katrina and Wilma. She has seen the destruction first hand and saw it coming in what is likely a clearer lens than most people. And all of this work and travel has led her to understand climate change like few others. Climate is changing and while human behaviour has sped up the change, climate is going to change no matter what. Although there is continued debate about whether the climate is changing or whether its human behaviour that has caused it, Claire thinks the most important question is not necessarily being addressed – how are we adapting to the new climate reality. Claire discussed how condos are creeping closer and closer to the water’s edge in Florida and destroying some of the natural vegetation that is there to help lessen hurricane damage. She even mentioned Brad Pitt building new homes in New Orleans on stilts. Why is a movie actor doing this and not the government? Building higher levies can’t be the only answer because what happens when those levies are breached? Homes need to adapt to the climate realities. I left this lunch with the continued bit of regret in my belly that I didn’t study meteorology in university. I think about it sometimes because I do geek out about weather and I was no slouch at physics and math. Ah well, at least I’m able to use my lunch blog to step into the shoes of a meteorologist for a brief moment. The work Claire does is even more interesting that I could have imagined.